The Right Rev. Jack L. Iker, Bishop of Fort Worth assisted by The Rev. Reginald Mallett, Vicar, officiated at the ground breaking of the new church on July 23, 1995, and the laying of the cornerstone on March 16, 1996. It was dedicated and consecrated by Bishop Iker, with The Rev. Canon Charles A. Hough assisting, on June 16, 1996. The beautiful red brick structure sits on a hilltop under huge oak trees. 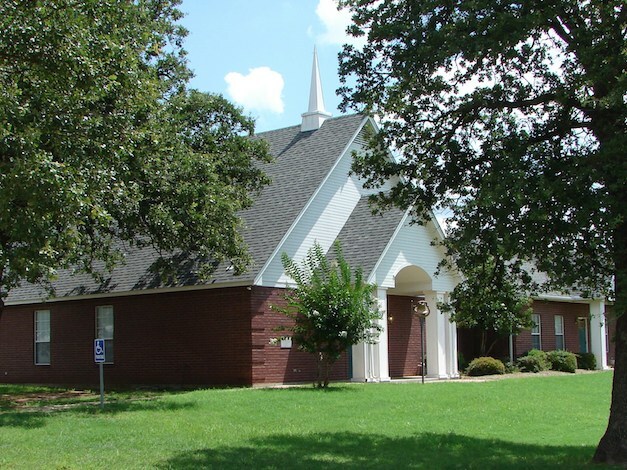 The congregation comes from small towns throughout the county, including Alvord, Boyd, Chico, and Paradise, as well as Bridgeport, Decatur, and the surrounding rural areas. The Rev. Ryan Reed became the first long-term vicar of Ascension and St. Mark in 1997, staying until his election as Dean of St. Vincent's Cathedral Church in May, 2002. Through his outreach ministry to the Hispanic community, the need for an Hispanic service developed. The Hispanic mission was led in its infancy by The Reverend Sergio Diaz. The church was served by interim vicar, The Rev. Dr. William Risinger, Jr., for several months. 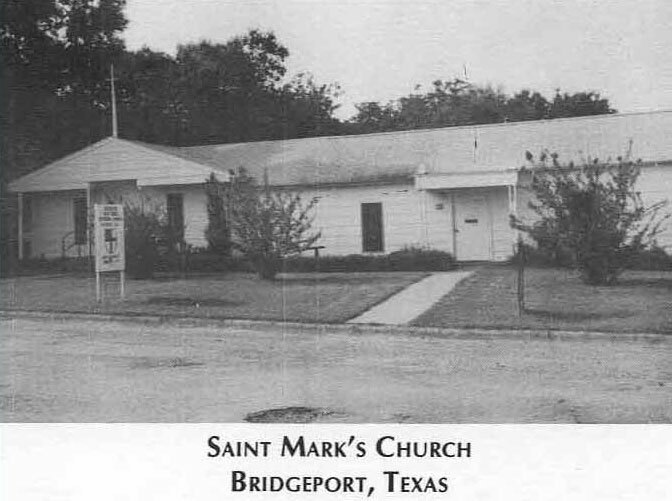 St. Mark was begun in Bridgeport in 1965 as the result of a survey conducted by Bruce Coggin, a student at Seabury Seminary. Founding members included Peggy Barnsley, John and Faye Burt, Jane Coggin, Mary Hoehn, Dr. William and Carolyn Hunter, Juddie Wilkes, and Biff Yarbrough. Jane Coggin was the mother of Bruce Coggin, Juddie Wilkes refinished the first Altar used by the mission, and Dr. Hunter served as Senior Warden many times until his death. Richard and Kemper Walker moved to Bridgeport in 1967 and joined St. Mark. They have the longest ties to the original St. Mark congregation. The group met first in a small house on Carpenter Street, later added a prefabricated home to the structure, eventually connected the two together, but always sought to buy property and build. The Church of the Ascension was founded in Decatur in 1888 by the great English missionary, Bishop Alexander Garrett. Its tiny building sat on Main Street about two blocks west of the town square until 1912, when Father Crittendon had it moved on the same lot, but facing Walnut Street. With intermittent services held by visiting priests, its membership diminished. In the late 1920s, Father Maceo had the building renovated and regular services were re-established. His efforts were continued by Father Virden and others. The building was sold by Bishop Harry T. Moore in 1940 and became a mattress factory for a time. The history of Ascension and St. Mark is an ongoing project, based on documents and memories of long-time members. If you can add to this study in any way, please connect to us through our comments link. Though this may be an incomplete look at the past, it is our story as we know it at this time. The Episcopal Church of Wise County, Ascension and St. Mark, is a mission of the Episcopal Diocese of Fort Worth. It was formed from the combination of two smaller missions located in Bridgeport and Decatur. Both missions started as part of the historic Diocese of Dallas. 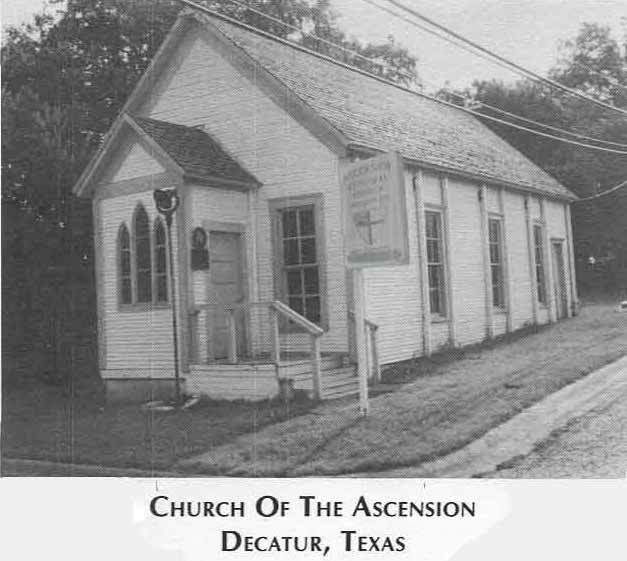 In 1966, a parish consisting of Ascension, St. Mark, and St. Patrick in Bowie was considered. That idea of the united group, called Trinity Greater Parish, was to have a chapel in each town with a warden to oversee facilities and chapel needs; however, one vestry with two members from each chapel, one weekday school for children's education rather than a Sunday school, and one women's group would provide a stronger tie to others of the faith. The Trinity Parish was to be served by one priest, who would have services in all three chapels each Sunday. The first Diocesan Missioner for Trinity Greater Parish was The Rev. Vernon A. Gothcer, but in December, 1966, as part of the worker-priest movement in the Dallas Diocese, the Bishop appointed Denny Vinson, a Denton pharmacist, to be ordained as a Deacon with his ordination as a Priest to follow in six months. Fr. Vinson held services at each chapel weekly. Eucharist was served monthly. A proposal to merge the two Wise County missions was made in 1974 by The Reverend Lawrence Irwin Ferguson, J.D. This was no doubt due to the success of the Mission of St. Mark. This growing mission just 10 miles away helped the members of Ascension consider consolidation. There had been ties between the two from the beginning of St. Mark. One signature on the petition by St. Mark which sought "the services of the Protestant Episcopal Church through the Diocese of Dallas" is that of Miss Ada Cates, the forceful lady who had saved the Church of the Ascension after its sale in 1940. With the formation of the Fort Worth Diocese in 1983, Wise County's churches became missions of the new diocese. Priests served for varying periods of time. At St. Mark some included Michael Winsor and Jeff Logan, who each served as their first church after completing seminary. In 1992, the two congregations united. The purchase of ten acres of land about halfway between the towns allowed for a new vision of growth. Plans had originally been made to move the historic Church of the Ascension from Decatur to the new building site. However, it found a new lease on life as a non-denominational wedding chapel, and was sold by the diocese in 1999. It still stands at the corner of Church and Hale Streets in Decatur. From October, 2002, through July, 2005, The Rev. Christopher Allen served as Vicar. Fr. Allen, was the first bi-lingual priest at Ascension and St. Mark, enabling not only English and Spanish services each Sunday, but having celebrations of worship in both English and Spanish throughout the year, with congregants participating in their chosen language. This led to a better understanding and support of the differences in the two cultures who share in the joy of worship. Though still officially a mission, growth continued toward parish status, evidenced by the acquisition of a new building, needed for expansion of the Christian ed program. During his tenure, Daughters of the King became an important prayer and service ministry for women of the church. Fr. Allen led this congregation through difficult times within the ECUSA, clarifying issues and alleviating fears. He left Wise County to become a military chaplain, serving Marines bound for Iraq. The Reverend DeWayne Adams arrived in August, 2005, with Ascension & St. Mark, his first Anglican church. Though newly ordained, he was not new to the pulpit; having served as a Baptist minister for many years. Fr. Adams was fluent in Spanish, and he continued the Hispanic/English ministry, now almost a decade old. During his time at Ascension and St. Mark, a building project more than doubled the size of the facilities. In 2013, he moved to Breckenridge, TX where he serves St. Andrew’s Episcopal Church. The current vicar at Ascension & St. Mark is The Rev. Keith Roberson, who came to Wise County in 2013 and lives in Bridgeport with his wife Holly. He has served at four churches since his ordination in 2000 and has served in various roles at the diocesan level. His outgoing personality has led to a new joy in the parish family, with annual events such as kite flying on Ascension day and the Blessing of the Animals to celebrate St. Francis Day. Join us to meet and get to know our entire parish family. One adamant member, Miss Ada Cates, confronted the Bishop with such force, the money from the sale was returned to her keeping. She then re-purchased the building, bought another lot, and had the building moved to the corner of Church and Hale Streets. Designated a Texas Historic Landmark in 1968, it remains at that site today. Long-time members recall that the church, locally known as the Little Church of the Crosses, had so little heat in the winter that members wrapped themselves in blankets and quilts during service. Its entry way is so narrow that coffins could not make the turn into the church, so funerals could not be held there. Even with such historic charm and emotional attachment, it could no longer serve the needs of the congregation. As Ascension's membership was struggling to maintain its mission church, another group of Episcopalians in Wise County found themselves, as a local news story of the time put it, "cow-birding their spiritual eggs in alien nests." Though many attended other local churches, they wanted to "plant the seeds of growth so that this area would be able to have a responsible development as a part of the Diocese of Dallas."